In 1970, Interpreters Unlimited (IU) was established with the mission to provide language services nationwide. More than 40 years later, the IU database is currently comprised of over 8,000 language experts across the country offering interpretation and translation services in 130+ languages. To better service its clients on the east coast, the Interpreters Unlimited MidAtlantic office was opened. The office is conveniently located in Columbia, Maryland midway between Baltimore and Washington D.C. - our aim is to provide superior customer satisfaction to our growing client base in this region. Our expansive network of language experts and accurate, on-time service, have propelled IU to the forefront of a growing industry. Interpreters Unlimited ensures that the best qualified interpreter or translator is assigned to each project ensuring quality, professionalism, and accuracy. Our language experts possess a variety of certifications by organizations such as the American Translation Association (ATA) and the Registry of Interpreters for the Deaf (RID). Interpreters Unlimited stands behind the quality of our work, offering a service guarantee for all translations and interpretation appointments. 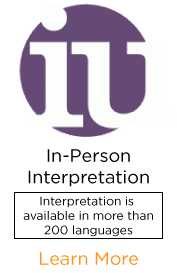 IU has developed a niche in the medical, legal, government and corporate industries; our interpreters undergo training to ensure understanding of all industry-specific terminology and requirements. With our robust, proprietary software, clients can place new interpreter requests 24 hours a day/7 days a week. Our customer care team is also available around the clock to address any questions or concerns.